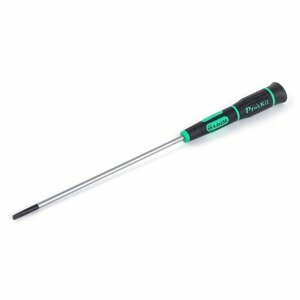 Pro'sKit SD-081-S8 slotted screwdriver is a precision screwdriver made of chrome-molybdenum-vanadium steel. A handle of Pro'sKit SD-081-S8 is made of nylon plastic and equipped with a fast-turning TPR anti-slip top. Handle shape and dimensions are ideal for comfortable operation. For more info about the features if various types of screwdrivers and their application, please read the article "Screwdrivers: Main Types&Sizes".